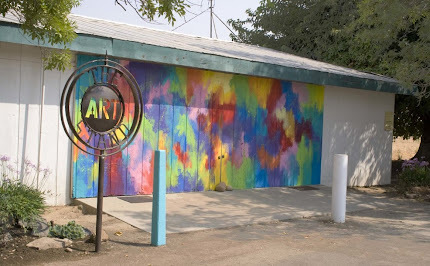 The Art Stand Gallery is an artists' cooperative gallery with 14 local artists from the Central San Joaquin Valley of California. Located on the Blossom Trail and the way to Kings Canyon National Park, the Art Stand Gallery is located in a historic fruit stand, and its displays reflect the charm of a rustic agricultural icon. The gallery has a wide variety of fine art and fine crafts, displayed in a unique fashion. The Art Stand Gallery has watercolors, oil and acrylic paintings, mixed media works, pastels, fine photography, jewelry, ceramics and sculptures, fiber arts, art dolls, glass and many other items. Originals, giclee prints, shrink-wrapped paintings, and greeting cards are always available. Shows change seasonally. Labels/Topics of Past Posts--Click to view a topic of your choice! FresnoArts Net/Art Hop information etc. Our Current Season and then, Our Upcoming Seasons. . . .
Our gallery is seeking new members. Would you be interested? Check out this photo collage of our gallery in different seasons during different events, put together by members Martin Nunez and Chieko Delgado. Contact tswood@thegardenandthezoo.com with "ASG membership" in the Subject box. We're looking forward to new art partnership. Email The Art Stand Gallery or Call for more information!